Chetola, one of the South’s finest resorts, has combined with the Hound Ears Club to provide an unforgettable couples’ experience, both on and off the golf course. The private Hound Ears course is a unique layout in that higher handicap golfers enjoy good scoring rounds but lower handicap golfers are challenged to shoot low. Hound Ears plays to 6,400 yards from the back tees and, except for two or three holes on each side, is relatively flat. The view of Grandfather Mountain from the sixth tee is spectacular. The par-3 15th hole — only 110 yards long from an elevated tee — is one of the most exciting par-3 holes in the state. Rivers, tumbling mountain streams, ponds, mountain views and rhododendron add to the course’s scenic beauty. Because Hound Ears is a private club, access to play the course is only through member sponsorship or a stay at Chetola, an 87-acre resort that is one of the most beautiful in the country. It overlooks a peaceful seven-acre private lake and its Manor House, which houses Timberlake’s Restaurant and the Bob Timberlake Inn, was built in the mid-19th century. Chetola is a Cherokee name which means “haven of rest,” and that name is a perfect description of the resort. The two-night golf package includes a day of golf at Hound Ears and a day or two to be spoiled at Chetola. The resort offers fly fishing, swimming, boating, tennis, hiking, horseback riding packages and a fitness center. To recover from the resort’s activities and golf, Chetola’s spa provides massages, facials and nail treatments plus use of a sauna and jacuzzi. The village of Blowing Rock, recognized as having one of North Carolina’s most beautiful main streets, is within easy walking distance. A short trail also leads to the Shoppes On The Parkway on one end of the resort and a 3,600 acre national park on the other end. The Blue Ridge Parkway, “America’s Favorite Scenic Drive,” runs adjacent to Chetola. 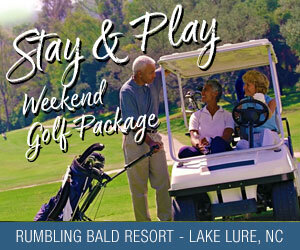 The two-night golf package (there are one-night options) includes lodging in Chetola Lodge, the Bob Timberlake Inn or a spacious condominium; one day’s green fees and cart at Hound Ears, and breakfast each morning (except for those staying in a condominium). Contact Chetola by phone (828/295-5500) or online at info@chetola.com. For more information about Chetola and Hound Ears, visit their websites: chetola.com and houndears.com.